I am SO excited about our new Wednesday folders and how much time they have been saving me!! -I would grade my students’ tests (still do this of course ). For all tests that had a score of C- or lower, I would staple a piece of paper that asked the parent to sign that they saw the test and to have the student return the slip of paper to me the following day. – The next day if I remembered, I would check off the students who returned their tests, and then remind the rest of the students one-on-one that they still needed to bring in a signed test. b. A week (or two) passed with no sign of the test, and by that point I had moved on. Needless to say, not the most effective process, or best use of my time! The 5th grade teacher at my school is super organized and everything in her room seems to always be in its place. When I asked her about what she does about sending home students’ tests, she told me about her Wednesday folders and I knew that this was something I needed to start in my class as well! Wednesdays are the days that our school’s family envelopes go home, and it also gives me time to grade our Friday spelling tests and math quizzes. I bought the plastic folders when they were on sale, and I’m hoping they hold up better than the paper ones. 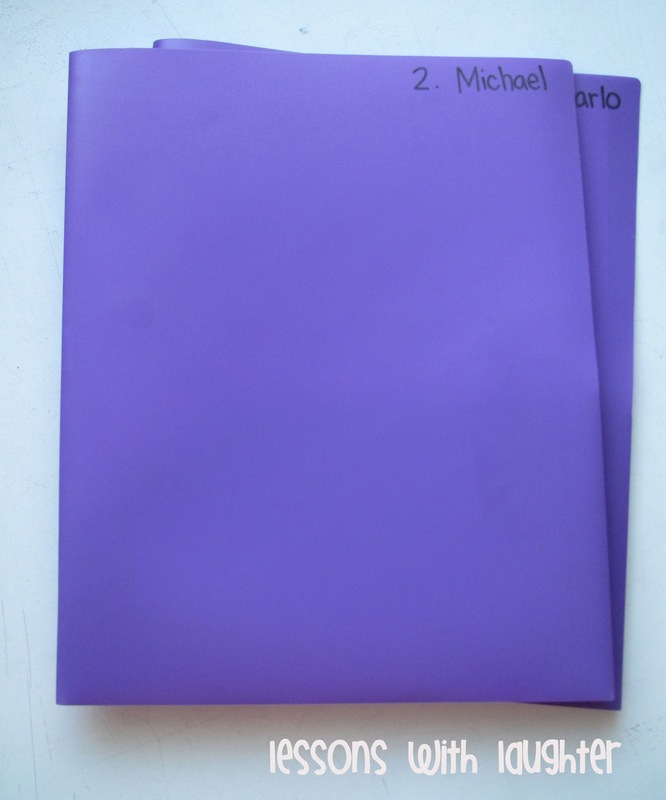 Then I labeled each folder with the students’ name and number. All graded tests that have been graded for the week go in the folder to go home and be signed by parents. 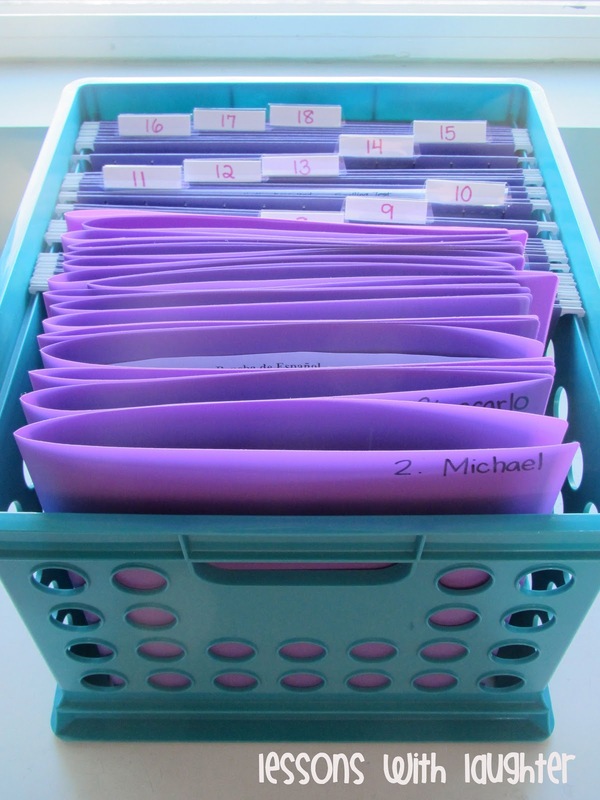 When students return their folders it is easy to check and make sure that all the tests that went home in the folder are returned. Each student also has a file folder (I used numbers on these instead of names so I don’t have to change them every year) which I put their tests in after they come back signed. Then I put the folders in order in the front of the crate. My new number sorter is AMAZING and is keeping everything in number order so it’s easy to enter grades into my grade book and then put their tests in their folders! We’ve been using this for a couple weeks, and I have really been loving this new procedure! This way I know that parents are seeing students’ tests and I feel like the whole process is much more organized and time consuming! Thanks SO much Jane for sharing your wonderful organization ideas with me! Hope you all have a wonderful Wednesday tomorrow! I do the same type of thing, only I have Friday folders – so it's the tests from the previous week that head home. I have a sticker on those tests that need to be signed asking for a parent signature and there is a line on them. 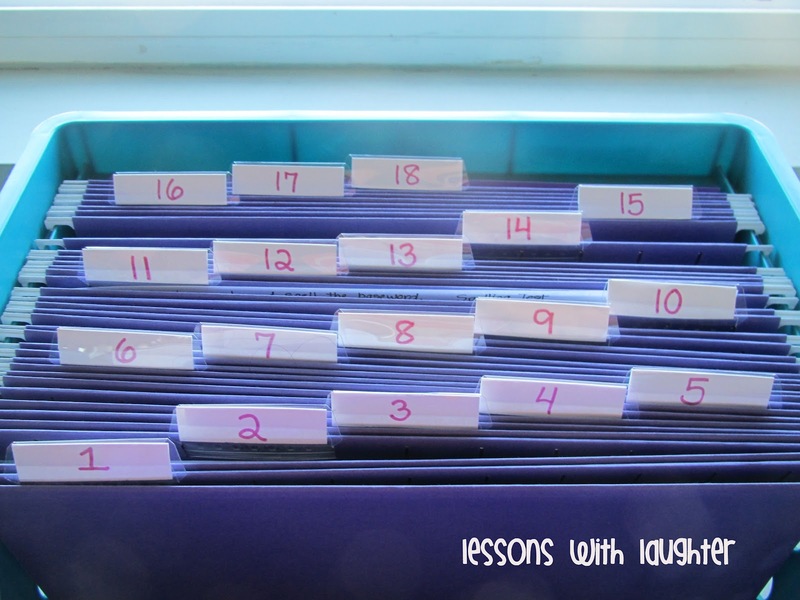 It's easy to just grade and stick something on top – seeing that I never have a stapler around when I need it. Just wondering why you have the students bring back all the tests? Or is it just the ones that weren't passing? Hi Molly! I LOVE the idea of a Wednesday folder. We do Friday Folders at our school ,and it's our school wide communication day. Wednesday folders would be fabulous because it would give more time to get those spelling test and reading quizzes graded that I give on Fridays, and less chance of papers being misplaced that need to be returned. Thanks for sharing! It is so much easier for me to just collect all the signed tests instead of keeping track of who needs to return which tests. And by collecting them (and having them signed) I can make sure that each student's parents actually saw all the tests! After math tests are signed I plan on using them to address misunderstandings in our guided math groups and I can check back on them throughout the quarter to make sure they aren't making the same mistakes each test. Since we are using a spiral program, the same types of problems will come up over and over again throughout the year! I am planning on emptying their tests out their folders at the end of each quarter. I have used the same system for years and I love it! Our school buys a heavy laminated folder that gets sent home on Wednesdays too. I send home my things on the same day. I am the 5th grade teacher, that Molly referred to in her post. I collect and keep tests because I do not want them passed on to younger siblings, cousins, or friends. It's also great to be able to pull them out to reference when having conferences with parents. This is very cool Molly (and Jane!). I have to check out your number sorter now!! I really like this idea!! Thans for sharing! Love these!! Thanks for sharing. The folder idea is great, I am going to use it next year. I just ordered my sorter and I'm going to completely steal your idea of the Wesnesday folders. It's genius! !